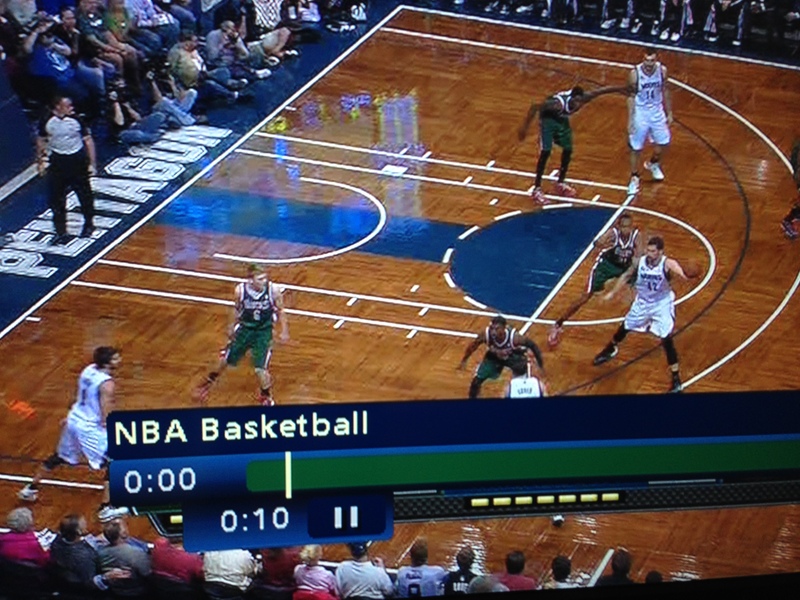 Here’s a snapshot of what the Wolves’ offensive sets have often looked like. Hi-Tech stuff here (don’t mind the DVR pause bar). So, there’s been a lot written already about the Wolves and the players’ individual performances so far during the preseason. Patrick J: One angle that has gotten less attention is some of the sets that the Wolves have tried to run – with, shall we say, “mixed” results. The set basically looks like this: Ricky takes the inbounds pass, dribbles past half court, quickly passes to a wing and cuts through to the strongside corner. The idea is that a post–often Kevin Love–will make himself available for a high-post entry. Then, the ball is in Love’s hands and the offense flows from there. The idea, I think is that Love will either be able to score the ball from the elbow, take a dribble and pass or score, or drive the ball off of a jab fake and get to the rim. This offensive set seems to meet with limited success. The fly in the ointment is Ricky. Two reasons: (1) he isn’t great without the ball in his hands, and (2) he isn’t a credible threat to make a kickout catch-and-shoot opportunity from the corner. So, his defender can basically fade to crowd the high post and make the options for the high-post man that much more difficult to execute. So, if this is to be one of the Wolves’ go-to sets, can it work? Should Kevin Martin basically have the Rubio responsibility–if and when he’s healthy again–to put a real threat in the strong-side corner? What gives? Andy G: Yeah, this new entry to the Wolves O has been one of the *real* takeaways from the early preseason action. The picture I took of my TV screen shows what the set looks like, after Ricky has passed to the wing (Shved in this case, mostly blocked in the pic) and cut to the corner. The starting unit has not looked good in the short sampling of using this wing entry. You identify one reason for that: Ricky is not a threat to score as a spot shooter. Another reason is the opportunity cost of not playing with pick and rolls. Rubio and Shved are both at their best when improvising against a defense scrambling to recover from a big screen set by Love or Pekovic. A passing, motion-type offense has benefits, but it might not be ideal for this team. So yeah. What Andrei said. Two other options will exist in this set, along with the Love-scoring possibilities you mention: One is that Ricky will cut backdoor and Love will hit him for a layup. Chances are, this will only happen against reckless defenders who haven’t read the scouting report. But hey, we gotta beat the bad teams, too. The second is that the wing won’t pass to Love, but will instead dribble off of a screen set by him. This would seem like a good option when Shved is playing the wing, since he’s at his best playing pick-and-roll. I can envision Shabazz doing some of this on the right wing, playing to his dominant hand, too. Anyway, it’s something to look at. Andy G: There’s a game tonight at Target Center. The last one at home until The Opener on 10/30. Toronto Raptors come to town. Bill Bayno makes his anticipated return. Rudy Gay will be here, but unfortunately for him, David Kahn isn’t around to make him a huge Kahntract offer. Gay finally bit the bullet and got his vision corrected. Maybe that’ll lead to better jump shooting? I guess we will see. What are you looking for in tonight’s game? Patrick J: The Wolves already beat the Raps once this week. Kevin Love had, by far, his best game of the preseason, with 20 and 9 in limited minutes. It would be nice to see another really strong performance from Love as part of his Redemption Tour. But we’ll see what happens tonight. You pretty much know what you’ll see from the Wolves. The starters will play limited minutes, except Kevin Martin, who won’t play. Either Shabazz or Derrick Williams will play; the other won’t. Alexey will have ups and downs. J.J. will do stuff. Gorgui will block 1-4 shots. Meanwhile, the Raptors have compiled a roster that shows flashes of being decent down the line, and is already fairly cool. He’s also a functional scorer in the NBA. They need to guard him out to 21 feet. Closely. Terrence Ross is another cool Raptor. He’s one of the few guys who’s a better dunker in this League than DeMar. Finally, another Rap to watch is Jonas Valančiūnas. He’s the guy the Wolves should’ve drafted instead of Derrick Williams. The dude has very nice upside and looks to come into his own this season for Toronto. He’ll be a handful for the Wolves front line during the minutes they match up. The Wolves look to get to 3-1 tonight. We’ll be watching. Follow along with us on Twitter @PDWolves. Good stuff guys. Another positive thing that can happen out of the set you describe (and picture) is that upon the pass to Love, Pek can dive to the post, pinning his man to receive that high-low pass from Love. Once he gets his spot, it’s pretty much over. Good point, Eric. That’s the pass (I think) Flip & Adelman have been pining for him to make consistently this season. It’s deadly when he makes it.